The ultimate show for kids 0-6 years. 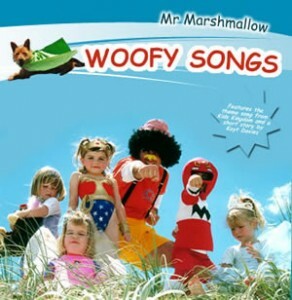 Woofy Songs is the first CD by Mr Marshmallow. These songs are designed to help children with speech problems, encourage them to pack up their toys, go to sleep, share, eat well and exercise. Most of the songs on the CD were co-written with Skyla whom also sings track 16 (The 123 Ba Ba Dance). The CD is considered to be a fun learning tool. Mr Marshmallow also played the music for the TV show Kids Kingdom.